Make Music is a free celebration of music around the world on June 21st – Summer Solstice. Launched in 1982 in France as the Fête de la Musique, it is now held on the same day in more than 750 cities in 120 countries. Long Beach is joining the celebration and we want YOU to be a part of it! Ready to join in on the celebration here in Long Beach? PERFORMERS: Sign up and make your profile unique by uploading a photo, description of your act, and any relevant website/social media links. Check out the available venues and send a request to one that will fit your needs. The venue will confirm your request, & you’re all set! VENUES: Sign up and make your profile for your location with information and a description of the space. Check out musician profiles, then request a performance, or invite musicians to submit to your space on their own. Confirm the performance and make sure your space is ready to go on June 21st! What is Make Music Long Beach? Make Music Long Beach is open to anyone who wants to take part. Every kind of musician — young and old, amateur and professional, of every musical persuasion — pours onto streets, parks, plazas, and porches to share their music with friends, neighbors, and strangers. All of it is free and open to the public. When and where will Make Music Long Beach take place? MMLB will take place on Thursday, June 21st 2018. The same date that a multitude of cities celebrate Fête de la Musique all throughout the world. Performances can be scheduled from 10:00 AM to 10:00 PM in spaces open for public participation throughout Long Beach. Sidewalks, parks, and more may become impromptu musical stages, dance floors, and social meeting points. Why isn’t it always on a weekend? We celebrate the Summer Solstice, the longest day of the year, with a day of music. As do over 700 cities around the world. The Summer Solstice occurs on June 21st. June 21st doesn’t always land on a weekend. Plus, what better reason to celebrate during the middle of the week? MMLB is open to EVERYONE! Students, amateurs, part-time professionals, and established artists are all welcome. There is no audition process to be included in the musical merriment and MMLB is open to all ages, skill levels, and persuasions of music makers. All you you need to do is sign up, make your match with a venue, show up, and perform. Get creative! Even non-musicians are invited to participate by dancing, singing along with a crowd, or even helping to organize a flash mob. Performances will take place in a variety of outdoor & indoor spaces. The goal is to generate a continuous soundscape of music as people walk around participating spaces. Unlike many traditional music events, MMLB does not have one central venue. We envision music corridors throughout all neighborhoods of Long Beach. The possibilities are endless and all it takes is a little creativity. Sidewalks: Many musicians will perform on the sidewalks otherwise known as “street performing”. Parks, Community Centers, Gardens and Plazas: Some public spaces are privately controlled by community groups, management companies, or individuals. These can be fantastic performance locations – quiet, yet accessible. People who control these spaces will make many of them available on our website. If a perfect site isn’t listed, check with the owners to see if they’re interested! Private Spaces: Restaurants, businesses, community organizations and homeowners may wish to offer their locale as a venue. We welcome all comers. The only requirements are that the performance space is open to the public at no cost and is outdoors. How long will each performance last? You have complete artistic control. It’s your concert. Try to work with the venue owner if that is not you and find a time that best suits your needs. In other cities we’ve seen performances as short as a single song and as long as 18 hours. Artists and venues must agree to the length of your performance during the matchmaking process. Then, when you perform you must stick to the set length you agreed to so that the city-wide published performance schedule stays on track. May performers take full advantage of MMLB and perform multiple times during the day? No. At this time scheduling more than one performance is not recommended. What if a band signs up now, and has to back out later? Once your event is confirmed by your chosen location, and by the MMLB organizers, we will block off your spot. We are counting on you to perform! If you do need to cancel, it is your responsibility to find another performer to take your spot. Please let the location – and us – know about all program changes ASAP, so that MMLB and the venue can help find a replacement. Join or organize a “Mass Appeal” event! The big idea is that scores of musicians who have never performed together before can band together to perform massive pieces. Think, a squad of acoustic guitars all playing the same song at the same time. You get the idea! Each performance works differently, depending on the genre, the instrument, and the location. We’ll be releasing more info on “Mass Appeals” soon. I am part of a large drumming circle, and we’d like to perform at the solstice sunrise. Noise ordinances and common sense are not suspended for MMLB. Basically 10:00 AM – 8:00 PM are acceptable times for higher decibel sound, and acceptable locations are non-residential areas where people will not be disturbed in their homes. There can be some exceptions – in past years there have been a few cases of neighborhoods hosting venues with later performances, planned in cooperation with surrounding homeowners. How do we sign up to perform in parks? Who will provide a stage / tuned grand piano / etc for my concert? MMLBis not a typical music festival. It is a DIY opportunity for people to be creative about putting together their own musical events. Our organizers set up the framework for concerts — the rest is up to you! Artists and locations collaborate to produce the events, provide electricity, if needed, and provide any necessary equipment. Will there be a main stage? There will be no main stage. Long Beach itself is your stage. This is not an event focused around built stages, so performances generally take place at the same level as the audience. Your stage could be a front porch, a restaurant patio, a park bench, or any other outdoor space you can imagine. Do you have somewhere you’d love to play? Convince that location to register as a venue! Will I be paid to perform? MMLB is a citywide celebration of summer and part of an international movement. As part of this international celebration, MMLB agrees to offer all performances for free to the public. As is the case with other cities around the world, our contribution is setting up the framework for performances by securing the permits, coordinating the concerts, and publicizing the event city-wide with media stories, concert listings with our media partners, an interactive website, and a volunteer street-team. Participation at any level, as a musician, host, or spectator is voluntary. This allows musicians of all skill levels the opportunity to come out and perform in public if they wish. While most performers volunteer their time and talents, both venues and musicians are welcome to seek outside sponsorship and support if they so choose. Can I charge admission for a MMLB concert? No. All MMLB concerts are free and open to the public. Can I block off a street? You may apply for a block party type of permit on your own. No. All MMLB performances are free and open to the public. However, there may be a couple of venues that are 21+ only. Can I perform outside the city limits of Long Beach? Of course! But if you fall outside of our city limits please contact Make Music Los Angeles to see how you can be a part of a celebration in another city close by. Yes. While we encourage musicians to find an outdoor venue, many businesses such as restaurant/bars, retail shops, and coffee shops are all eager to host. How do I sign up to perform or host a concert? Musicians and venues will use our registration and matchmaking tool, which is hosted on this site, in order to register and make concert arrangements with each other. If you encounter problems, please contact us at [email protected] and we’ll work through the problem together. On the registration page I see that MMLB runs from 10:00 AM to 10:00 PM. Wow, that is a long event! It’s likely that the number of events per hour will increase as the day goes along. This just give you the option of playing/hosting your event whenever works best for you and your audience. The matchmaking software asks for my facebook and website addresses. I don’t have facebook or a website. Does this mean I can’t register? Facebook or a website is not required. We ask for the links to allow potential venues and performers to learn more about each other before committing to the match. After matchmaking is complete, our website will allow prospective audiences to sample your work and allow you to promote yourself. If you incorrectly enter information in these boxes, you won’t be allowed to continue. Information entered should be accurate, or the box should be left blank. I’m a venue. Why is there a check box that says “Accepting requests from artists to perform here?” I wouldn’t be signing up if I weren’t accepting performers. When your venue is full, you will un-check this box. We’ll see your venue, and performance schedule, and see that it is full. Why am I restricted to three choices for the type of music I perform or that my venue will accept? This arbitrary limit is to make finding the right match easier. Use the “Other” choice and the description box to override this limitation. Then, you can tell us about your music styling in the description box. If you represent a venue open to all types of music- just say so in your description. I see there is a box asking me how I will promote my performance and I have no idea how to promote my performance. Do I need to promote my performance or venue to participate? Everyone who signs up on our matchmaking website should describe what they will do for promotion. We are counting on musicians and locations to promote their own shows, in all the ways that they normally would — sending out email blasts, putting notices on websites, texting all of their friends, etc. What will MMLB do to help promote my concert? We will list all concerts on the MMLB website (with descriptions and links to artist websites, where available), and we’ll pitch stories about noteworthy concerts to the press. If you are a venue and would like an “Orange Package” please reach out to us directly at: [email protected] MMLB neighborhood organizers also will promote the performances in their area with fliers, posters, etc. I’ve signed up as an artist or a venue and I’m ready to make a match. Can you break down the approval process in the software for me? You can see all of the details on any artist or performer who fits your search criteria from either the browse or account pages. Use the box with the drop down menus labeled “venue type”, “neighborhood” and “electricity” to narrow your choices. Use the small triangle to the left of the name of the artist or venue to see all of the details on that option. You can see all available venues and performers by selecting the browse feature, but the matchmaking actually happens on your account page. I’ve looked at all of my options and chosen some possible venues or musicians. What happens now? After you make a choice, that choice will receive an email to notify them. Then both sides need to confirm, modify or decline the opportunity. If you wish to modify, you should contact the other party to resolve the problem. When you agree on a match it will be recorded, and then MMLB will then examine and send final approval to both parties. Before approval by artist, venue and the webmaster, your desired match will appear on your “Account” page under “My Performances”; note that until all three parties have approved, the match is “pending confirmation”. After approval by artist, venue, and MMLB, the match will be recorded at “Performances”. We completed our matchmaking last week, but our completed match still says “Pending Confirmation”. What gives? MMLB must confirm each performance before it is final. In most cases MMLB will confirm your performance and venue match within two weeks. To allow for an ample assortment of musicians to fill out our matchmaking inventory, we will not begin confirming most matches before April 1st. If your venue and performer are certain you have a firm commitment, there is no need to worry, you are going steady and we will not force a break up. Do I need to check in with my “Account” page to see if there are any pending matches? No worries. When someone requests a match, you will be emailed a notification to login and check the match. Let’s say I signed up two weeks ago as either a venue or a performer and no one has picked my venue/performance. When should I start to worry? It may take time to make a match. Keep in mind that the registration will be open until June 18th, so new musicians and venues will be appearing over the entire time period. If you don’t see what you want today, come back at another time. Or, be creative in your matchmaking. Venues may contact musicians not already registered in the matchmaking software to ask them to sign up. Likewise, performers may contact venues where they’d like to perform and ask them to sign up as venues. Also consider that venues can be almost any public place in Long Beach where people can gather without impeding traffic. The playground down the street, the pet store’s parking lot, the plaza outside your office building could all be venues. My performance was denied. Why? Some reasons for a denial might be because the venue’s time slots all have been filled, or the venue cannot accommodate your type of music or number of performers. Don’t despair, try to find another match. A venue or performer wants to modify my request for a match. What is required of me now? The modify request in our matchmaking software is there to set up a performance schedule that works for both the venue and performer. If a request needs to be modified in some way other than time, you will need to contact the other party to work through details of the modification. It’s June 18th and there is still no match. Should I be heartbroken? MMLB wants to make sure everyone who wants to perform can perform. After June 18th, registration will close, but participants will have another week to match. We will contact musicians and venues that haven’t been able to create a match through the software and will propose some creative options for your inclusion in the MMLB merriment. We are in the happiness business and don’t want you to be disappointed or left out. 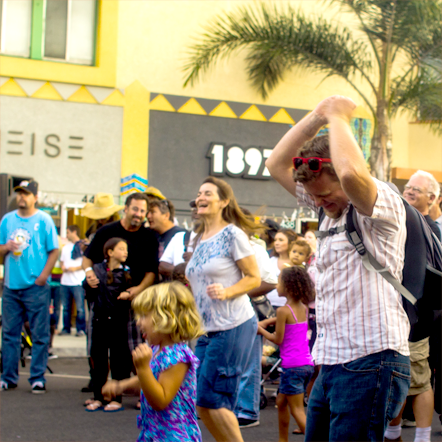 Launched in 2018, Make Music Long Beach, a volunteer-based organization, joins an informal confederation of over 700 cities worldwide in creating opportunities for all stripes of music makers to take to the streets to celebrate the summer solstice. Volunteer organizers in Long Beach will work throughout the city to help recruit musicians and venues, handle permits, and promote the concerts. There are lots of ways to volunteer. Contact us at [email protected] and we’ll run the options by you. Can I donate to MMLB?